While many clients will gain the proverbial 10 to 20 lbs this holiday season after overindulging in an abundance of food, desserts, and drinks, RDs can pass on the good news that this doesn’t necessarily have to happen. In this month’s E-News Exclusive, Today’s Dietitian (TD) provides tips and appetizer recipes dietitians can share with clients to help them keep many unwanted pounds at bay. 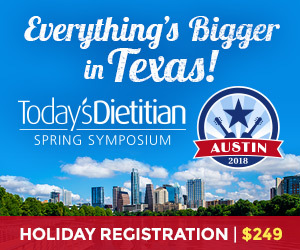 After reading the article, visit TD’s website at www.TodaysDietitian.com to read the digital edition of the December issue, which includes articles on plant-based appetizers, nutrients for a sharp memory, high-protein diets and weight loss, and vitamin E.
It’s hard to believe 2018 is right around the corner. The new year often means different things to many people. It’s a time to reflect on where they’ve been, where they are, and perhaps where they hope to be this time next year. Whether you or your clients shun the idea of making resolutions or enter the new year with a laundry list of goals, we all have some areas of our lives we’d like to improve. Not surprisingly, most resolutions focus on diet and exercise. The anticipation of gluttony over the holidays can strike fear in all of us, as though we’re doomed to gain those dreaded holiday pounds. As nutrition professionals, we know gaining unwanted weight isn’t inevitable, and it will be important to regularly remind clients of this throughout this festive season. In the spirit of celebrating this upcoming new year, I’m sharing some of my tried and true tips to stay healthy during the holiday plus my favorite (and simple) appetizer recipes that are sure to shine at any New Year’s Eve gathering. The recently opened Riverview Hope Campus in Fort Smith, Arkansas, serves three meals per day on a nominal budget to residents in need, the Greenwood Democrat reports. A nutrition report released by the World Health Organization shows that undernutrition is still persistent in Africa at large and the number of stunted children has increased. A bite of bad yogurt or sip of spoiled milk could be a thing of the past thanks to a new sensor developed by Silvana Andreescu, PhD. The innovative “smart label” is a low-cost, portable, paper-based sensor that can determine when food or cosmetics spoil and has the ability to transform the commercial marketplace. Through the use of nanostructures, the sensors catch and bind the predetermined compounds to distinguish change. To test a sample, researchers simply add it to the reactive surface. How far beyond expiration the item is can be detected based on the intensity of the transformation, which is emitted as a color or electrical change. It’s a simple innovation that could tell consumers when the quality of the product changes—even if the item is past its “best before” date. Learn about statin medications and the role RDs play in the management of patients with hyperlipidemia in this month’s issue of Today’s Dietitian. Read the CPE Monthly article, take the 10-question online test at CE.TodaysDietitian.com, and earn two CEUs! Holiday Rate only $249 through December 31! REGISTER NOW! Registration does not include accommodations or travel to and from Austin, TX. Coming up in our January 2018 issue is our Fresh Ideas Showcase. E-mail a sales representative to be part of this unique advertising opportunity.